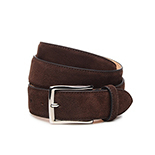 It can be difficult for fashionable men to accessorise their look. 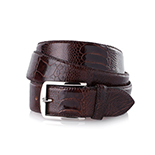 With not many options out there, traditional leather belts play an important role in stating your style credentials. 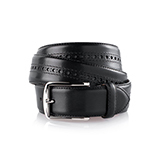 Coordinated to your shoes they round off an elegant appearance. 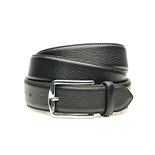 All sewn men’s belts in our collection are crafted from exactly the same leather we use to produce our Goodyear-welted shoes. Choose from a wide range of truly high quality leather belts. Two-layer stitched leather belt in black/brown soft calf with hand finish. 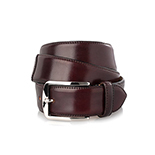 Two-layer stitched leather belt in bordeaux soft calf with hand finish. 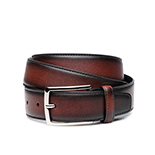 Two-layer stitched leather belt in brandy soft calf with hand finish. 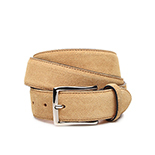 Two-layer stitched leather belt in whiskey soft calf with hand finish. 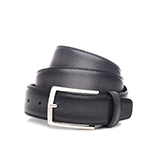 Two-layer stitched leather belt in grey soft calf with hand finish. 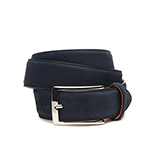 Two-layer stitched leather belt in navy soft calf with hand finish. 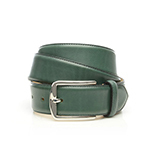 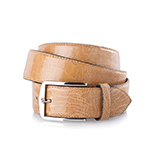 Two-layer stitched leather belt in nut soft calf with hand finish. 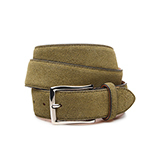 Two-layer stitched leather belt in khaki, crafted from velours. Two-layer stitched, leather belt in light-brown, crafted from velours. 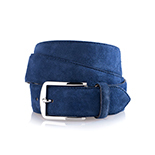 Two-layer stitched leather belt in blue, crafted from nubuck. 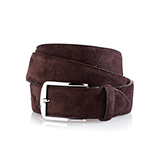 Two-layer stitched leather belt in dark brown, crafted from velours. 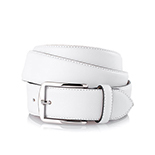 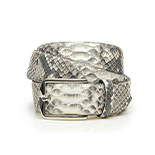 Two-layer stitched leather belt in white, crafted from python skin. 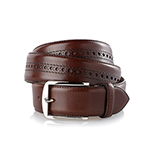 Leather belts enjoy a long history and even today they remain a much-loved accessory for the modern gentleman. 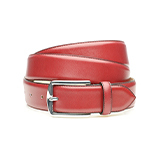 With both practical and aesthetic applications, they need to be high-quality and boast great style. 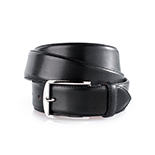 Fortunately, the leather belts in our collection are crafted from exactly the same leather, we use to manufacture our Goodyear-welted footwear. 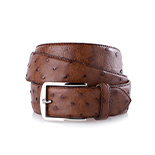 Men’s leather belts were first invented in the Bronze Age (2200 BC to 800 BC). Between then and now, belts have waxed and waned in popularity but in the late 20th century they were rediscovered as the most popular means for holding trousers up. 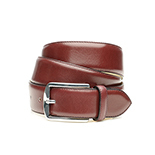 Besides their functional side, modern belts have evolved to be fashion items in their own right. 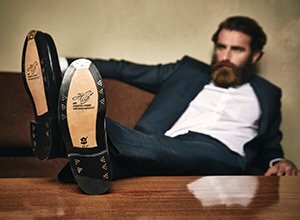 A man who cares for his shoes also cares about the rest of its outfit. 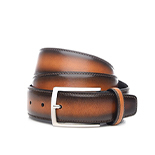 Match your belt to your shoes, and you will round off a stylish appearance perfectly. 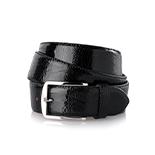 A well-known style rule states simply, that your leather belt should match the upper of your footwear. 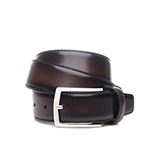 With our men’s leather belts, that could not any simpler: both our belts and shoes are made from the same high quality leather, meaning both boast the same elegant style and durability. Furthermore, we also offer the right belt for all lovers of our exotic collection. 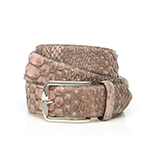 Whether it is ostrich, python, alligator or lizard – our leather belts leave nothing to be desired. 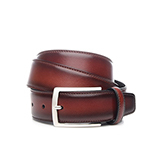 Each of our leather belts consists of two leather layers, tightly stitched together. 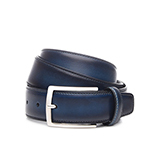 The inside is made from untreated box calf, while the outside is crafted from dyed leather. 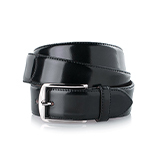 With a width of 35 mm, they are the ideal choice for any formal occasion. 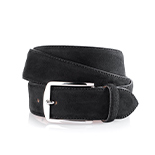 Of course velours, brogue or woven belts also look great with a more casual outfit. 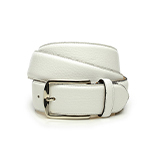 A luxurious buckle, made of a nickel-free zinc alloy suitable for allergy sufferers, closes our leather belt and is easily adjusted at any time. 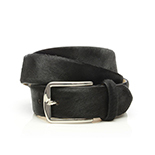 Our leather belts come in different lengths. 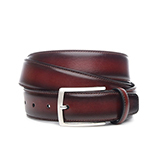 Traditionally, a leather belt boasts five belt-holes; therefore and the length is measured to the third belt-hole. Simply measure your waist to determine the right-sized leather belt for you.